At No 28 on the Green Party list, Rayna Fahey isn't going to Parliament any time soon. Based in Melbourne, Fahey's job is to muster party votes for the Greens from Victoria's large Kiwi expat community. This is an important role, assigned to a trusted party activist. Rayna Fahey comes from the anarchist wing of the Green Party and is one of its most militant activists. Fahey became involved in anarchist politics at Waikato University in the early '00s. She stood for the students association executive in 2001 (Women's Rights officer) and unsuccessfully on the Green ticket for Hamilton City Coucil the same year. From 2002 to 2005 Fahey worked in Parliament as executive assistant to Green MPs mike Ward and Nandor Tanczos. Like Fahey, Tanczos was a former Waikato University anarchist anarchist and both were well connected to the Wellington radical community. Ms Fahey, a Young Greens coordinator...will take over as Nandor’s Executive Assistant this week. Among other portfolios, Nandor is the Green Party spokesperson for Tertiary Education and Youth Affairs. “Given her experience and energy, Rayna will provide a vital link between students, young people and the Greens,” said Nandor, former editor of Waikato student paper Nexus. During her time in Wellington was involved in anarchist activities including work with Indymedia, Anti Bypass Action, the anti GE campaign and anti racism/Treaty of Waitangi activism. In October 2003, while still working for Tanczos, Fahey, joined several other activists in stripping naked and lying down to spell out `No GE' on Parliament's lawn. This protest was led by well known activist Val Morse. Many of Rayna Fahey's Wellington anarchist friends (including Val Morse and the Bailey siblings) became famous in October 2007 when they were arrested for allegedly participating in terrorist training camps in the Urewera Mountains. Fahey moved to Australia in 2006 and was soon vey active in the Melbourne anarchist scene and the Victorian Green Party. Other involvements included MadGE Australia (anti GE), Earthsharing Australia and the ultra radical Aboriginal sovereignty group Black GST(Genocide to end, Sovereignty acknowledged, Treaty to be made) campaign. Rayna fahey worked closely with another melbourne based expat anarchist and revolutionary Sina Ana Brown-Davis. 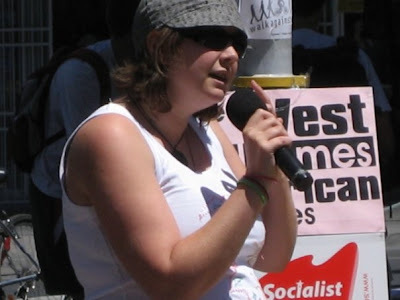 Together with Brown-Davis, Rayna Fahey has led much of the protest action in Australia over the anti terrorist arrests. Footage from the rally held at Federation Square Melbourne, 27 October 2007, as part of a global day of action against NZ anti terror arrests. Her strong connections to many activist communities within Aotearoa, Australia and the rest of the world, focus mostly on environmental, economic and indigenous justice issues. Somehow the Greens forgot to mention Rayna Fahey's commitment to anarchism and support for gun toting, camo wearing Urewera radicals. Come off it Trev what about Act Party No. 10 Shawn Tan's support for the Urewera radicals? The difference is anon, that Shawn has changed his views, while Rayna hasn't. People can change and should be given credit for doing so. Trevor. Since you have changed your blog's layout it takes forever to load properly, both before and after my month's broadband has run out. Doesn't look like Shawn has changed all of his views Trev, its ok for the NF to have guns tho aii? White is all right... eh?